We had a wonderful experience working with Sharon Steele to buy our first home in Cranford. We met Sharon about two years ago at an open house in Cranford and could tell instantly that Sharon was just the right realtor for us— she is smart, straightforward, and a very supportive real estate agent. Sharon has a wealth of knowledge about the town of Cranford and surrounding areas. 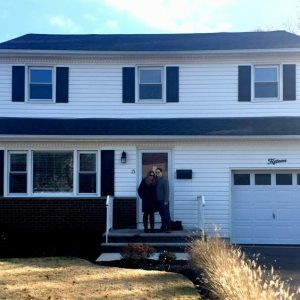 Her style is very straightforward—she explained and lead us through the process of home buying in a manner that was comprehensible and not overwhelming. Sharon was very supportive throughout our search- she was by our side for two years and did not pressure us into buying a house. She was very responsive to our questions and connected us to top professionals in the area. She constantly checked in to see how we were doing and has followed up since our closing. Sharon made our first time home buying experience seamless. She also has a wonderful assistant, Angela, who is also very responsive and helpful—they make a great team! I highly recommend Sharon Steele and hope she continues to have lots of success in her career. My husband and I joke that Cranford should be renamed Cranford Steele—Sharon is that well known and knowledgeable about the town.